I returned from a trip to Lapland and Russia today, and noticed that the battery of my Macbook had somehow died while I was away. Now the computer doesn’t recognize it at all. This means I have no possibilities for using the laptop while traveling to Turku for the weekend and to Tampere next week for the OpenMind conference, unless the Mac store is able to replace the battery tomorrow morning. 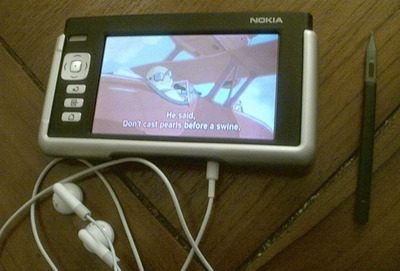 Since the fate of the computer is uncertain I decided to secure at least some entertainment for the trips in form of watching movies on my Nokia 770. The conversion procedure from DVDs to the format supported by the tiny device is fairly easy using the HandBrake movie converter. Now what remains to be seen is how long the battery of the Nokia device lasts when watching movies. Updated 2006-10-22: I watched the 30s classic aviation film Hell’s Angels on a train ride from Helsinki to Turku yesterday. The movie was definitely watchable on the 770 screen, and the 2 hour trip used one fourth of the battery (as shown by the indicator). 29 March 2006. 1 minute read. 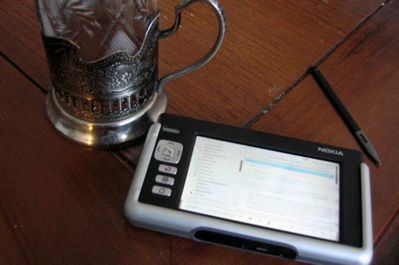 In order to make my news-reading process less time consuming, I’ve now switched from NetNewsWire running all the time on my PowerBook to the Bloglines web service primarily used through my Nokia 770 handheld browser. 08 February 2006. 2 minute read. 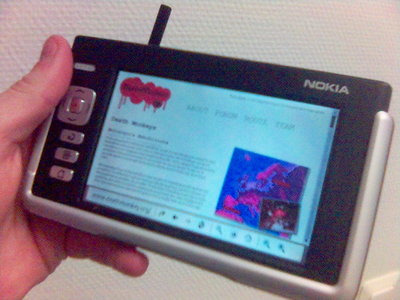 I had the Nokia 770 web browser device waiting on my desk as I returned from South Africa. 770 is a nice, small, Linux-powered internet appliance that is able to utilize either a WLAN connection, or mobile phone’s connection via Bluetooth.